In a medium bowl add pineapple and pudding, stir well to blend. Fold in rest of ingredients. Cover and refrigerate for one hour. Spoon into serving bowls and garnish with fresh mint leaf. Cook pasta according to package directions, drain well and chill for an hour or so. 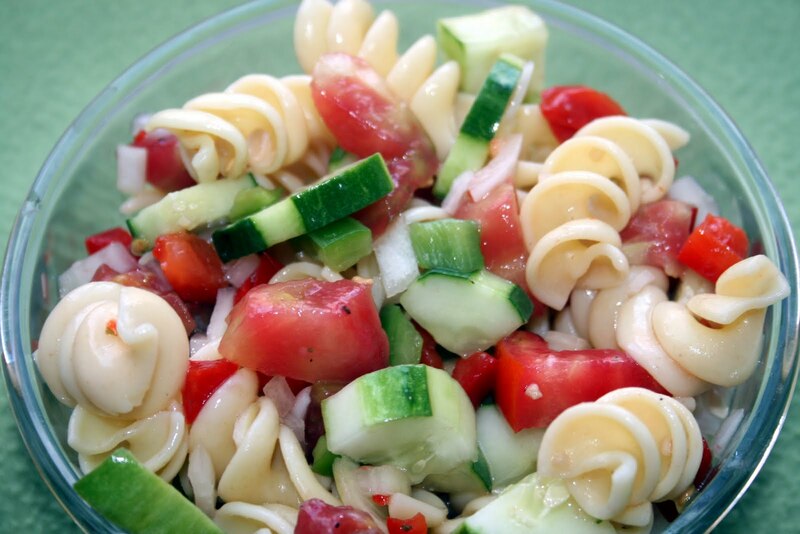 In a large bowl, mix together pasta, vegetables, and dressing. Toss lightly. Chill another hour before serving. Garnish with fresh, chopped basil leaves. Combine vegetables in a large bowl, set aside. In another combine the following ingredients: 1 cup orange juice, 2 tablespoons apple cider vinegar, 1 tablespoon fresh, chopped ginger, 2 tablespoons olive oil, 1 clove garlic, minced, 1/2 teaspoon ground cumin, 1/2 teaspoon ground coriander, 1/2 teaspoon ground cinnamon. Whisk together these ingredients and pour over vegetables, toss gently to coat. Chill for an hour and serve. Preheat oven to 350. Line a large baking pan with heavy duty foil. Grease or spray foil to prevent sticking. Combine chicken and soup with half the sour cream, cheese and cilantro. Spoon chicken mixture down center of each tortilla, roll up. Place seam-sides down, in foil lined pan. Top with salsa. Bake 30 minutes. Sprinkle extra cheese on if you like. Serve with a dollop of sour cream. In a large bowl, cream together butter and sugar until light and fluffy, add eggs one at a time. Stir in Bisquick and vanilla. Mix at low speed until well blended. Spread into prepared pan. Drop 16 large spoons of the pie filling evenly over the batter. Bake at 350 for 35-40 minutes until golden brown. The fruit will settle on the bottom of the pan. Cool for about 30 minutes, sprinkle with powdered sugar, cut into squares.